Fig. 1. 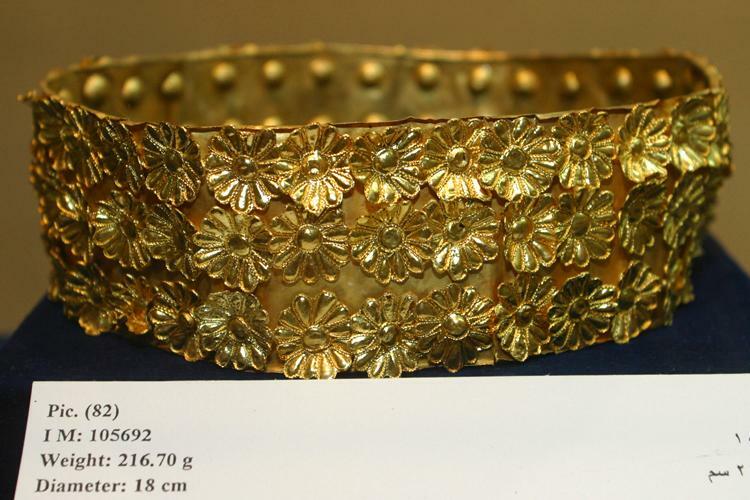 Gold rosette circlet, ht. 6 cm, diam. 18 cm, Tomb II, Northwest Palace, Nimrud. ND 1989.1; Baghdad, Iraq Museum, inv. no. 105692. Fig. 2. 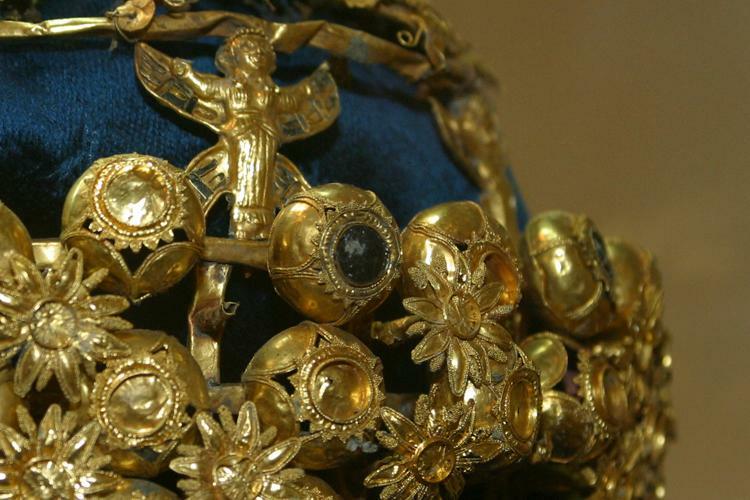 Detail of crown of gold, lapis lazuli, turquoise, bitumen, and other stones or paste, featuring flowers, fruits, bountiful grapevines, and fantastical female figures, ht. 16 cm, diam. 24 cm, Coffin 2, Tomb III, Northwest Palace, Nimrud. ND 1989.309; Baghdad, Iraq Museum, inv. no. 115619 (N.L. Feeney, 318th Public Affairs Operation Center [PAOC], U.S. Army, Baghdad 2003). Fig. 3. 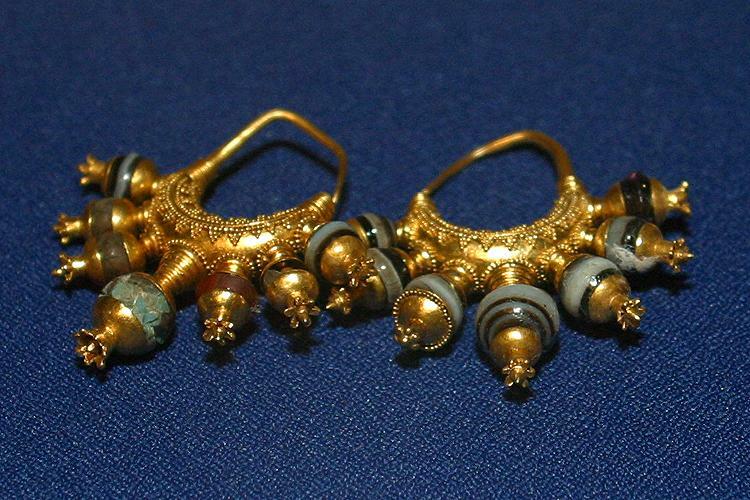 Pair of earrings with pomegranate pendants, gold with beads of agate and other stone, wdth. ca. 4 cm. Tomb II, Northwest Palace, Nimrud. ND 1989.38a, b; Baghdad, Iraq Museum, inv. nos. 105821, 105822 (N.L. Feeney, 318th Public Affairs Operation Center [PAOC], U.S. Army, Baghdad 2003). Fig. 4. 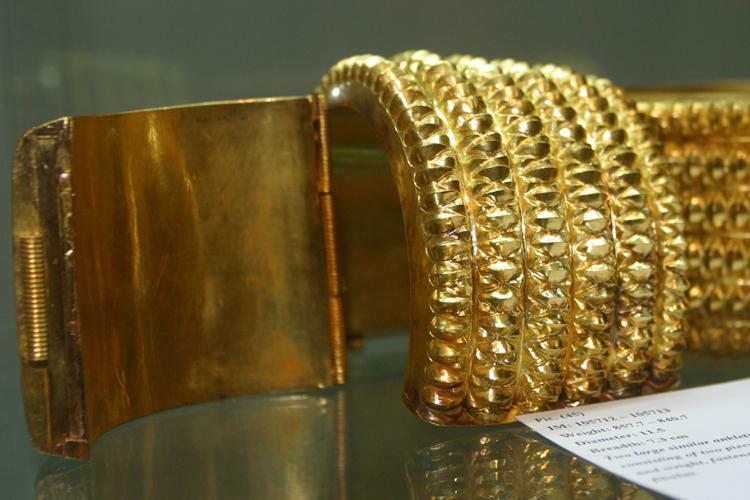 Gold torque, diam. ca. 22.5 cm, Tomb II, Northwest Palace, Nimrud. ND 1989.16; Baghdad, Iraq Museum, inv. no. 105714 (N.L. Feeney, 318th Public Affairs Operation Center [PAOC], U.S. Army, Baghdad 2003). Fig. 5. 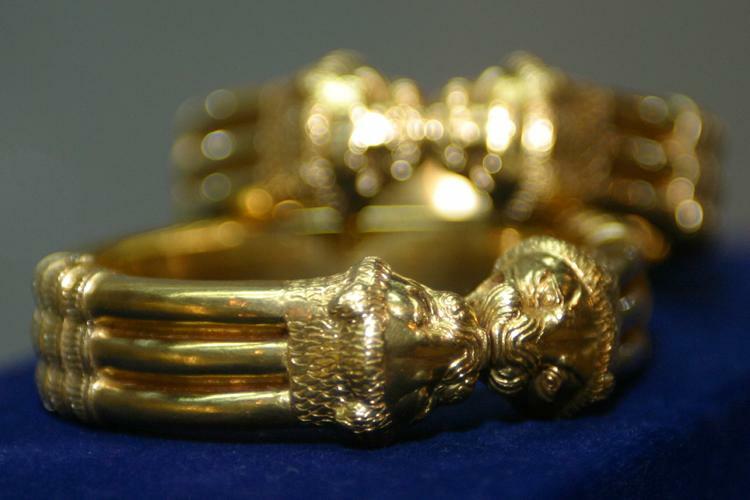 Pair of gold bracelets with lion-head terminals, diam. 7.2 cm, thickness 1.6 cm, Tomb II, Northwest Palace, Nimrud. ND 1989.9; Baghdad, Iraq Museum, inv. no. 105700-1 (N.L. Feeney, 318th Public Affairs Operation Center [PAOC], U.S. Army, Baghdad 2003). Fig. 6. 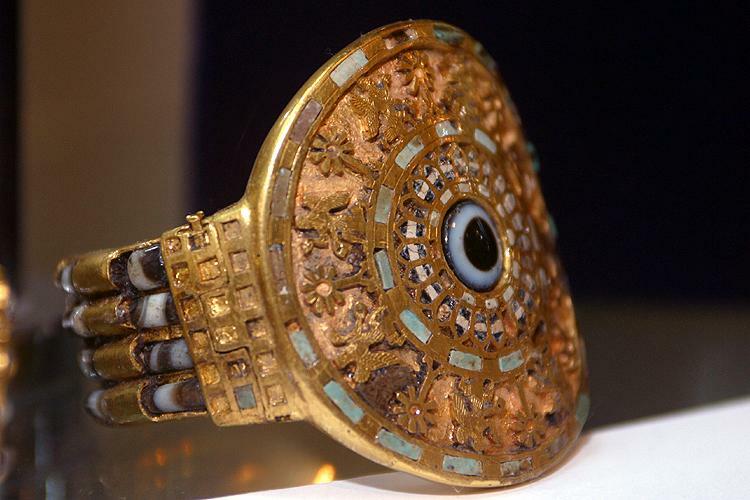 Detail of bracelet bearing a band of imagery depicting kneeling winged genies holding cones and buckets flanking sacred trees, gold inlaid with banded agate, agate eyestones, turquoise, and possibly faience, diam. of roundel ca. 6 cm, Tomb II, Northwest Palace, Nimrud. ND 1989.10; Baghdad, Iraq Museum, inv. no. 105702/3 (N.L. Feeney, 318th Public Affairs Operation Center [PAOC], U.S. Army, Baghdad 2003). Fig. 7. 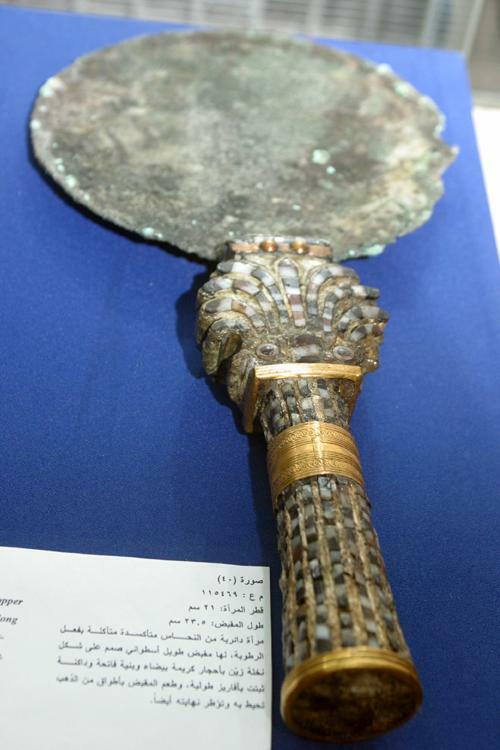 Mirror with handle in the form of a palm tree. Bronze, ivory, carnelian, agate, and gold, diam. 21 cm, lgth. of handle 23.5 cm, Tomb II, Northwest Palace, Nimrud. ND 1989.195; Baghdad, Iraq Museum, inv. no. 115469 (N.L. Feeney, 318th Public Affairs Operation Center [PAOC], U.S. Army, Baghdad 2003). Fig. 8. 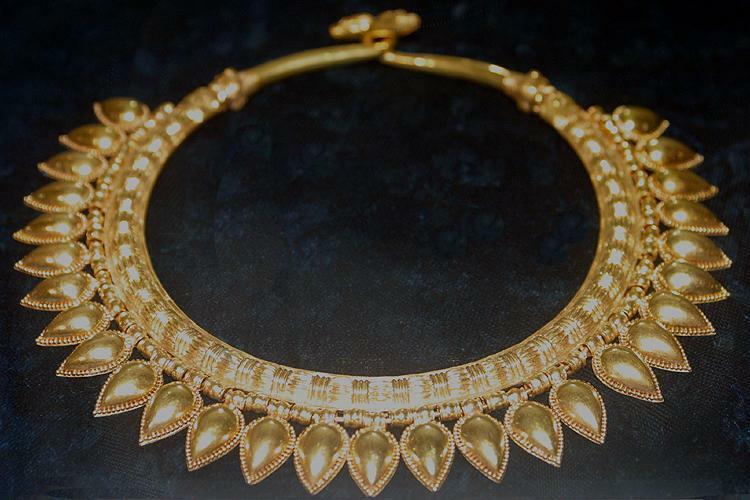 Gold ribbed anklet, shown unclasped, diam. 7.3 cm, Tomb II, Northwest Palace, Nimrud. ND 1989.15; Baghdad, Iraq Museum, inv. no. 105712/3 (N.L. Feeney, 318th Public Affairs Operation Center [PAOC], U.S. Army, Baghdad 2003). Fig. 9. 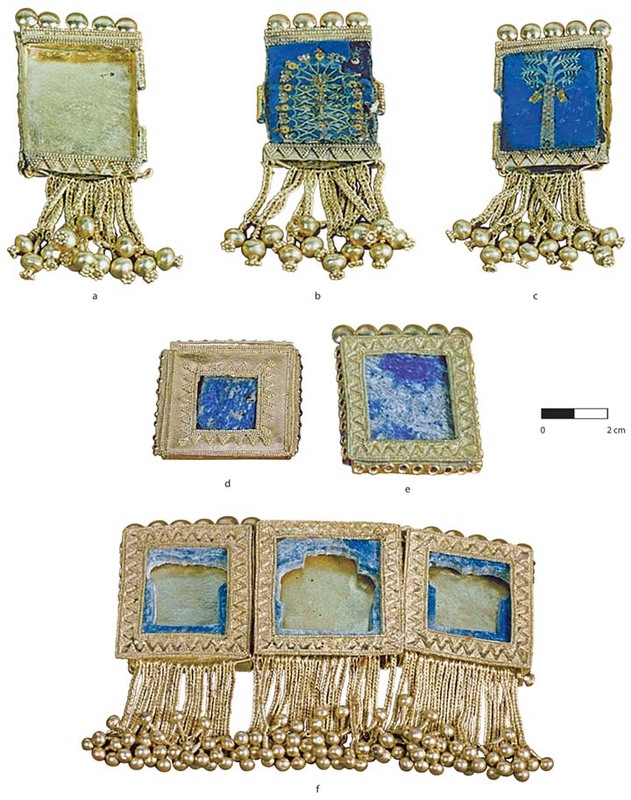 Segments from forehead ornaments of gold, lapis lazuli, carnelian, and turquoise, probably from diadems with dorsal streamers. Segments b and c, respectively, depict a stylized and naturalistic palm tree. Ht. of longest segment (segment b) ca. 8 cm. Tomb II, Northwest Palace, Nimrud: a, ND 1989.32c; Baghdad, Iraq Museum, inv. no. 104815; b, ND 1989.32b; Iraq Museum, inv. no. 105814; c, ND 1989.32a; Iraq Museum, inv. no. 105813; d, ND 1989.41a; Iraq Museum, inv. no. 105828; e, ND 1989.41b; Iraq Museum, inv. no 105829; f, ND 1989.41c–e; Iraq Museum, inv. nos. 105830–32 (Hussein 2016, pl. 38; courtesy the Oriental Institute of the University of Chicago). Note that the inventory number (104815) for segment a may be printed incorrectly in Hussein 2016, 79. Because all the other segments in this assemblage have inventory numbers beginning with “105,” the correct inventory for segment a may be 105815. Fig. 10. 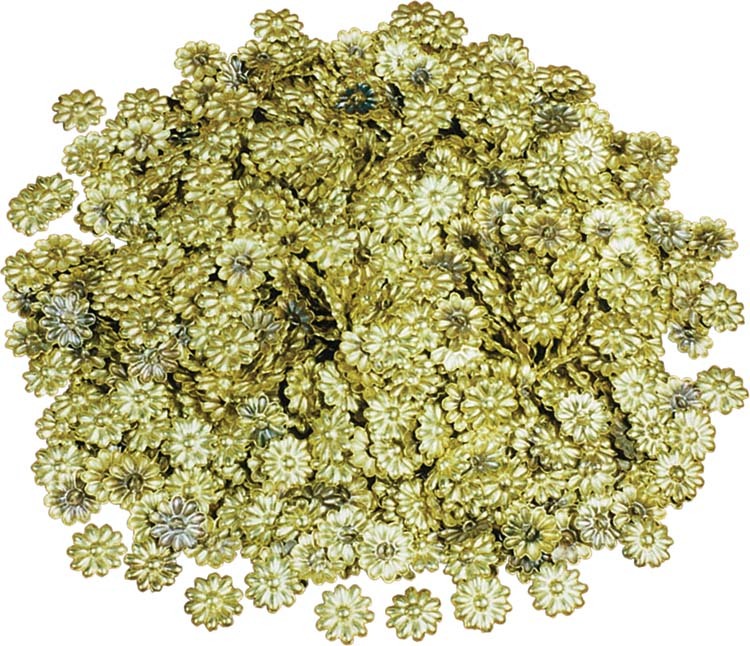 Gold garment ornaments in the form of 10-petaled rosettes, wdth. 1.5 cm, Tomb II, Northwest Palace, Nimrud. ND 1989.116; Baghdad, Iraq Museum, inv. no. 105983 (Hussein 2016, pl. 77; courtesy the Oriental Institute of the University of Chicago).